2018. What's old in Wollumbin? Big Volcano Visitor Guide. Travel updates to accommodation and tours around Byron Bay, Tweed Valley, NSW, Gold Coast, QLD, Australia. Far north coast, Northern Rivers NSW. You are here > Big Volcano Visitor Guide / Documents / What's New? 3 December, 2018 NEW! Have you checked out the Big Volcano Visitor Guide blog? We're now posting daily or every other day, currently with Big Volcano web site content summaries, and selected photos from our Instagram channel, along with other info. that appeals to us. 30 November, 2018Updated Bonalbo and Tabulam Visitor Guide and Campgrounds directory with Mallanganee Campground details. Wilderness Retreats directory updated with former retreats now out of business, removed. 28 November, 2018NEW! Greenhills Caravan Park, Murwillumbah. "Family owned caravan park with spacious sites suitable for tents, caravans, campers, small RVs and 5th wheelers only. Large rigs by arrangement. Choose from powered and unpowered sites, grass or double concrete slab. Some also drive through. Amenities block with plenty of hot water available. $25 pn unpowered, $30 pn powered sites for 2 people." 16 November, 2018 Updated Fig Tree Retro Studio description. "Surrounded by nature on 6 private acres of lush greenery, Fig Tree Retro Studio is ideal for a couple or solo adventurer, looking for a secluded location, but still just 5 minutes drive to Pottsville Beach. Featuring recycled timbers and comfy retro style furnishings, it's fully self-contained with a kitchenette and queen bed, with ceiling fans, electric heater, an outdoor deck, and a garden area. Bed and bath linen is provided, along with complimentary "Welcome Hamper" filled with breakfast goodies. From $95 pn, 2 nights min." 13 November, 2018Updated Midginbil Hill EcoResort Weddings page updated with new wedding videos. "Country getaway weddings at Midginbil Hill EcoResort where all your family and friends get to stay and play for 3 or more days." 30 October, 2018 Updated Midweek and Weekend Specials, Mango Tree Cottage is offering a Complimentary Cheese Platter + Bottle of Wine with every stay in November 2018. Also includes Booking.com deals for Byron Bay, Gold Coast hinterland, Kingscliff and Mount Tamborine. 28 October, 2018 NEW! We've updated our Artists, Designers & Studios directory, with more personally selected art products that you can purchase directly via RedBubble. If you're looking for an iconic image of the Gold Coast or Byron Bay, that says "local", then check these out. 25 October, 2018 Updated Midginbil Hill EcoResort Weddings page updated. "Country getaway weddings at Midginbil Hill EcoResort where all your family and friends get to stay and play for 3 or more days." 10 October, 2018NEW! Houseboat Holidays, Boat and Yacht Charter. We've got all known houseboat operators for the Northern Rivers and Gold Coast listed here, but now you can also check out other Australian houseboat holidays and river boat holiday options, including houseboat hire on the Murray River in NSW, as well as South Australia (SA) and the Northern Territory (NT) operators. 4 October, 2018 NEW! We've got an Art Shop. We've updated our Artists, Designers & Studios directory with personally selected art products that you can purchase directly via RedBubble. 20 September, 2018Updated Midweek and Weekend Specials, Accommodation specials, overnight breaks, midweek packages and weekend standby rates at accomodation in the Byron Bay - Gold Coast region. Already featuring Booking.com deals for Mount Tamborine and Byron Bay, it's been updated to include Booking.com deals for the Gold Coast and Kingscliff. Updated Honeymoons, Anniversaries, Romantic Holidays and Special Occasions. Find Honeymoons, romantic honeymoon destinations, elopements, anniversaries, special occasions and romantic holiday accommodation. Updated Boutique & Heritage Accommodation Whether it's old style elegance you're looking for, or laid back and funky accomodation, or maybe just an unusual and offbeat place to stay, it's probably here. Updated Couples Only Accommodation Find Honeymoons, romantic honeymoon destinations, elopements, anniversaries, special occasions and romantic holiday accommodation. Updated Cottages, Holiday Houses and Bungalows, that are available for holiday rental are sole dwelling, self contained premises, usually single story, where guests have exclusive occupancy. Updated Studio Apartments and Self Catering Units, are usually suited to couples or single travellers, and will offer open plan lounge, sleeping, kitchen or kitchenette area, and private or share bathroom facilities. Updated Fig Tree Retro Studio description. "Surrounded by nature on 6 private acres of lush greenery, Fig Tree Retro Studio is ideal for a couple or solo adventurer, looking for a secluded location, but still just 5 minutes drive to Pottsville Beach. Featuring recycled timbers and comfy retro style furnishings, it's fully self-contained with a kitchenette and queen bed, with ceiling fans, electric heater, an outdoor deck, and a garden area. Bed and bath linen is provided, along with complimentary "Welcome Hamper" filled with breakfast goodies. From $95 pn." 30 August, 2018Updated Minjungbal Aboriginal Cultural Centre. Museum and a shop opening hours updated to Monday to Friday, 9am-3pm. New Listings Farmers Markets and Weekend Markets The Green Marquee Twilight Markets - Currumbin Valley Eco Village 2nd Saturday: 2pm - 7pm QLD , and Lismore Vintage and Handmade Market - NR Conservatorium 1st Saturday: 10am to 2pm. 19 August, 2018 Updated Hire Services: Car Hire, Motorbike Hire (vehicle rentals) listing for Rent a Bomb. New location and phone number. 18 August, 2018 Updated Weekend Markets and Farmers Markets. NEW listings for Woodenbong Yowie Country Market on the last Saturday in May, August, November and February only, and Canungra Valley Market on the last Sunday of each month. Canungra Village Market previously held on the last Saturday in month, is no longer operating, and that listing is now deleted. Updated Adventure, Outdoors, Thrillseekers Activities, Day Tours and Cruises, and Meetings, Incentives, Conferences & Events Services with a new listing for Classic Aero Adventure Flights in Ballina. From family friendly joyflights to thrilling aerobatics in a fully restored CA-25 Winjeel military aircraft, you'll get a unique and memorable warbird flying experience. 7 August, 2018NEW A General Information Index for the "Information About Australia for Visitors" and "Information About this Region for Visitors" sections of the Big Volcano Visitor Guide, with a brief description of each page, and links to sub-sections. Updated Honeymoons, Anniversaries, Romantic Holidays. Find a romantic honeymoon, elopement, anniversary, or romantic holiday getaway. Choose from Big Volcano customers, and a personally curated selection of other local lodgings. 6 August, 2018Updated General Information about Australia for Visitors - Driving Information about Driving in Australia, with traveller tips and general information for visitors about road travel in Australia, including driving distances between capital cities and major destinations. All internal and external links have been checked and updated, and two informative YouTube videos have also been included. 5 August, 2018Updated General Information about Australia for Visitors - Hazards. You may encounter hazards of the climatic and animal kind, even in the parks and reserves of towns and cities, but especially if you go bush or head off the beaten track. All internal and external links have been checked and updated, and five YouTube videos have also been included. Updated Weekend Markets and Farmers Markets. Currumbin Wildlife Sanctuary Farmers' Market Saturday 6.30am - 11.30 am, now called the Sanctuary Market, every Friday 4pm to 9pm, and Currumbin Community Markets, time and contact details updated. 5 August, 2018Updated General Information about Australia for Visitors - Commerce.Content has been checked and updated where needed, for currency, credit cards and methods of payment, trading hours, tipping, public holidays, medical services, post services, telecommunications, and more, for visitors. All internal and external links have been checked and updated, and two YouTube videos have also been included. 23 July, 2018 Updated Antiques, Old Wares, Collectibles and Vintage listings. New and relocated shops listed. 23 July, 2018 Updated General Information about Australia for Visitors - Country. General Information about Australia for Visitors including global location, seasons, states and territories, time zones and daylight saving time with note about the NSW/QLD border region anomoly. All internal and external links have been checked and updated, and a YouTube video about "Time in Australia" with a transcript suitable for vision impaired people, has also been included. 21 July, 2018 Updated About this Region - Tourist Information. Tourist information about accommodation, tourist attractions, things to see and do, and visitor information about national parks and reserves in the Northern Rivers, far north coast of New South Wales, NSW, and Gold Coast hinterland, Queensland, QLD, Australia. All internal and external links have been checked and updated. 21 July, 2018 Updated About this Region - Getting Here. Visitor information and travellers advice on getting to the Northern Rivers - Gold Coast region of Austalia, with info about airports, rail services, road links, and driving distances between towns in the Northern Rivers NSW and capital cities. Airports operational stautses updated, all internal and external links have been checked and updated, and a YouTube video showing a landing at Tyagarah Airfield near Byron Bay, has been included. 17 July, 2018 Updated About this Region - Place. 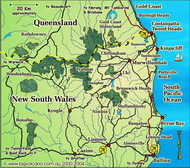 A brief introduction for visitors, to the towns and villages, of the Northern Rivers of New South Wales and Gold Coast hinterland region of Queensland. It includes location, climate, Local Government areas, and more. All internal and external links have been checked and updated, as well as YouTube videos which offer an introduction to the NSW state Parliamentary system, and another showing options for a four day visit to the Northern Rivers. 15 July, 2018 Updated Feature Stories / The Paths of Yoga - Unity in Diversity. A brief introduction to the origins of Yoga by Filomena Aversa, a yoga practitioner in Byron Bay. All internal and external links have been checked and updated, as well as three YouTube videos being included, which expand on the history of yoga and paths. 13 July, 2018 Updated Feature Stories / Wooyung - A History. A brief description of the Aboriginal and European settlement around the Wooyung area of the Tweed Coast, and subsequent building and purchase of the Wooyung Beach Holiday Park (aka Wooyung Motel and Caravan Park), along with a description of the adjacent Wooyung Nature Reserve. All internal and external links have been checked and updated, along with YouTube videos. 11 July, 2018 Updated Feature Stories / Tomewin - A History Tomewin became a resting place for the horses on the Cobb and Co. coach run between Murwillumbah and Nerang, ... Connecting the Currumbin and Tweed valleys, the steep terrain of the route was a feature of any travel along Tomewin Road. All internal and external links have been checked and updated. 10 July, 2018 Updated Feature Stories / Ships sunk off the Australian Coast 1939 - 1945 The Walk of Remembrance and Centaur Memorial is located on the headland at Point Danger, straddling the New South Wales and Queensland state border at the twin towns of Coolangatta and Tweed Heads. All internal and external links have been checked and updated. YouTube video from Australian National Maritime Museum, "Mythic Shipwrecks: Cerberus, Pandora and Centaur with Ed Slaughter". Updated Feature Stories / New Directions in Development A brief article summarising the launch of the Tweed Economic Development Corporation in 1998. While the TEDC has been reabsorbed back into Tweed Shire Council, many of the aims remain. All internal and external links have been checked and updated. Also included is a YouTube video list of useful Tweed Shire Council development and services videos. 9 July, 2018 Updated Feature Stories / Wholesome, Sustainable Outdoor Education in the Tweed A brief article summarising three agreed upon core components of the Outdoor Education Curriculum. All internal and external links also checked and updated. Also included is a YouTube video showing a recent OEC programme at one of our local OEC and School Camps providers. 8 July, 2018 Updated Feature Stories / Osprey Breeding Observations 1998 season. Report on Opsrey breeding season for 1998, as well as story form TSC asking for support from recreatoinal fishers. All internal and external links also checked and updated. 6 July, 2018 Updated Feature Stories / The Big Climb. Climbing Mount Warning in the World Heritage Central Eastern Rainforests (CERRA) of Australia sometimes results in unexpected rewards. All internal and external links checked and updated. Youtube videos checked and updated, and Mt Warning accommodation booking links checked and updated. Updated Feature Stories / Rare Mouse Found A new population of an endangered native mouse has been found for the first time in the World Heritage listed Border Ranges National Park. All internal and external links checked and updated. Youtube videos checked and updated, and Mt Warning accommodation booking links checked and updated..
5 July, 2018 Updated	Feature Stories / A New Rainforest Tree Species for New South Wales Article describing the rediscovery in the wild, and subsequent confirmation and scientific recognition of a new rainforest tree species. All internal and external links checked and updated. YouTube video confirmed and some photos added. Updated Feature Stories / Minjungbal Aboriginal Cultural Centre. Brief history of Bundjalung people in the region, and the establishment of the Minjungbal Aboriginal Cultural Centre at South Tweed Heads by Margaret Kay. All internal and external links checked and updated. 3 July, 2018	Updated	Golf courses and clubs in Northern NSW and Gold Coast hinterland with	selected accommodation close to or within driving distance of the golf course/clubs listed. 25 June, 2018 Updated Tyalgum	Visitor Guide. Tyalgum is an old cedar getting village, located virtually under the rim of the caldera due west of Mt Warning. Famous for its acoustically fine hall (with a tin roof), the village is now a popular weekend stop for recreational bikers and day trippers, visiting	the cafes, art, craft and gift shops, which have revitalised old shopfronts on the main street. A recently upgraded skate park with a playground and BBQ facilities is ideal for family picnics. 23 June, 2018 Updated	Caravan	Parks	and	Holiday	Parks. Most parks provide facilities suitable for the whole family, with almost all having a swimming pool, childrens playground, and providing a campers kitchen. 15 June, 2018	Updated Weekend Markets and Farmers Markets. Piggabeen Valley Market New time from 9am to 1pm, Emerald Lakes Gourmet Food and Craft Market Thursdays, new time from 3pm to 7pm, and new market included; Currumbin Community Markets - Currumbin RSL, Thursday 7am - 11am. 6 May, 2018Updated Midweek and Weekend Specials, Accommodation specials, overnight breaks, midweek packages and weekend standby rates at accomodation in the Byron Bay - Gold Coast region. Updated to include Booking.com deals for Mount Tamborine and Byron Bay. 16 April, 2018Updated Wedding Venues. Looking for the perfect place for your special day? Check out Wedding venues directory for the Northern Rivers of NSW and Gold Coast hinterland region, QLD. Ranging from fully catered wedding and reception venues, through to budget self catering DIY wedding venues, this wedding venue finder offers a selection of beautiful, unique, rustic and scenic wedding venues including beach and bush locations, in the local area. 12 April, 2018Updated Midweek and Weekend Specials, Accommodation specials, midweek packages and weekend standby rates at hideaway B&Bs and accomodation in the Byron Bay - Gold Coast region. 17 March, 2018Updated Pet friendly accommodation in the Byron Bay, Northern Rivers, NSW, to Gold Coast hinterland, QLD, region. Bring your four pawed baby with you on your next holiday! Updated Midweek and Weekend Specials, Accommodation specials, midweek packages and weekend standby rates at hideaway B&Bs and accomodation in the Byron Bay - Gold Coast region. Updated Holiday cabins, chalets and lodges in the Byron Bay, Tweed Valley, Northern Rivers of New South Wales, Gold Coast hinterland and Scenic Rim region of Queensland. Book direct or choose from especially selected Booking.com links. Updated Couples Only accommodation. Offering places where the accomodation is suitable for, or caters to adults only, our couples only accommodation is ideal for romantic getaways, a romantic weekend, midweek getaway or just a much needed break from work or family pressures. 2 February, 2018Updated Midweek & Weekend Specials The kids are back at school and the crowds are back at work, so book a quiet break and enjoy the company of your best mate, and four pawed baby in tow with Akoonah Cottages in the Byron hinterland. Updated Weekend Markets and Farmers Markets. The Plateau Market, Alstonville Showground, reinstated and moved to the 3rd Saturday 8am-2pm. Lismore Makers Market - NR Conservatorium Lismore 1st Saturday: 10am to 2pm No longer operating, listing removed. Updated Murwillumbah Visitor Guide: The Murwillumbah Visitor and World Heritage Rainforest Centre, has relocated across the road to the old railway station, after a cyclonic event in March 2017, and the popular 360-degree Green Cauldron Panorama, along with the Caldera Wildscapes Gallery, is now located in a Main Street gallery. Updated details and added photo for Whian Whian State Conservation Area. A former state forest, Whian Whian State Conservation Area (SCA) was created in 2003 to protect an area surrounded by Nightcap National Park. 24 January, 2018Updated Motels updated. Popular Murwillumbah accommodation, Poinciana Motel has re-opened after extensive renovations brought about by Ex TC Debbie in March 2017. Conveniently located close to Tweed Regional Gallery, choose from King, Queen and double rooms, with free WiFi available. 24 January, 2018Updated Midweek & Weekend Specials Mango Tree Cottage via Pottsville, Tweed Coast, End of Summer Special. 1 January, 2018Updated Campgrounds, Camping in public reserves, contact details for Tyalgum Showground.